As you probably know, Croatia national football team won the silver position at the FIFA World Cup 2018, therefore we decided to focus our weekly country report on best dental clinics in Croatia this week. 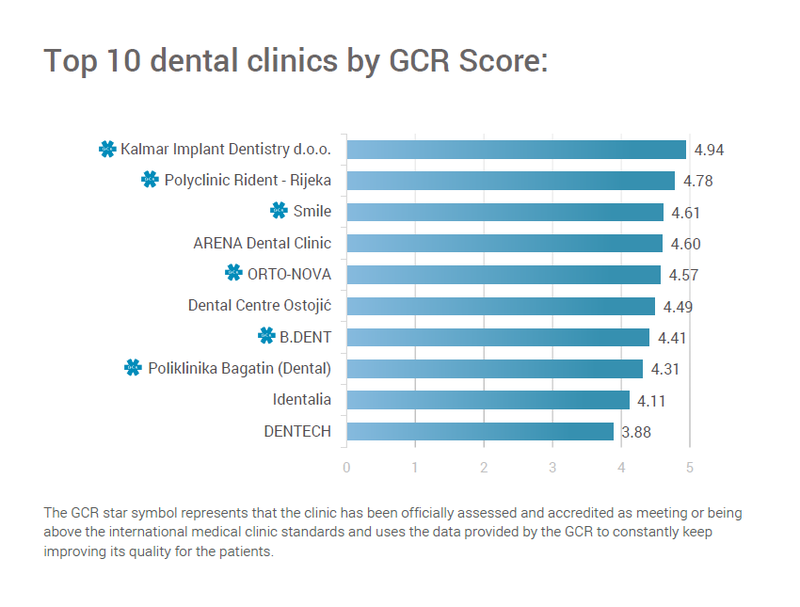 According to the GCR’s latest analysis of dental clinics in Croatia, Kalmar Implant Dentistry ranks as the leading clinic, when it comes to overall international clinic reputation. A total of 166 dental clinics were included in the study. The average GCR dental clinic quality score was 2.8. This evaluation demonstrates the huge range of rising healthcare standards available in the country. The GCR – Global Clinic Rating, the leading provider of healthcare clinic ratings worldwide, aggregated and analyzed dental clinics throughout Croatia during 2018 including dental clinics in Rijeka, Zagreb and Opatija. Kalmar Implant Dentistry ranked #1 with a GCR Score of 4.94, and ranks #1 from 126,070 dental clinics monitored worldwide, followed by Polyclinic Rident – Rijeka (4.78) and Smile (4.61). It is important to mention that all of this three clinics came out almost top (4.1-4.9) for Feedback Score. It’s important to point out that the GCR Scores may change daily. It depends on what has been recently changed within clinics’ expertise, facilities, services and patient feedback. As a result, every little change in the clinic’s profile can affect the overall GCR Score of that particular clinic. Download the GCR’s full report Top 10 Dental Clinics in Croatia to discover the names of the other dental clinics that made it to the Top 10 dental clinic list. You can find there some brief statistics on these clinics. Croatia is a young, modern country located in South-Eastern Europe and an EU member since 2013. It is bordering with Slovenia, Hungary, Serbia, and Bosnia Herzegovina. It is well-known as the small Mediterranean country with thousands of islands, amazing food and beautiful Adriatic sea. Croatia is a relative newcomer to the dental tourism market, offering highly competitive prices. The most popular dental treatment is dental implants, cosmetic dentistry, restorative and prosthetic dentistry. The dental clinics use the latest technology, perform procedures at highly competitive prices. Furthermore, if you decide to have a dental treatment done in Croatia, you will definitely avoid long waiting lists. Additionally, you will save money and even enjoy a holiday at the same time. With regular, affordable flights to Eastern Europe available from a number of airports, having dental treatment abroad has never been easier. Patients are more aware of the cost differences thanks to adverts and articles about dental tourism. Dental tourism does offer people the chance to save money on dental treatment, but patients still need to check out the quality of what is on offer.